There are many unsung hero’s who laid down their lives for the freedom of Khalistan. Many Singhs did Seva with their mind, body and soul but are unfortunately unheard of today. One shining example is that of Shaheed Bhai Baljinder Singh ‘Raju’, an unsung hero of the Khalistan liberation movement. Bhai Sahib joined the armed struggle for independence and carried out operations alongside the likes of Shaheed Bhai Harjinder Singh ‘Jinda’, Shaheed Bhai Sukhdev Singh ‘Sukha’ and many more freedom fighters of the Khalsa Panth. Shaheed Bhai Baljinder Singh Raju was born on the 13 August 1961, at the house of Sardar Santokh Singh and Mata Surjit Kaur. Bhai Sahib has an older sister; Baldev Kaur and a younger brother; Jaswinder Singh. Bhai Sahib came from a very blessed family. Bhai Raju’s father and Bhai Harjinder Singh Jinda’s mother are brother and sister, making Bhai Raju and Bhai Jinda cousin brothers. As they lived in Rajasthan, there was no Punjabi or Gurmat taught, so the only Gurmat they were taught was at home. Both of the Singhs were very courageous and showed a fearless character from a young age. Bhai Baljinder Singh had the desire to do Seva for the Panth because of his Gurmat based upbringing. He was taught Shabads at a young age and his mother would read Sikh History books to him. They had Sri Guru Granth Sahib Ji Maharaj Parkash at their house, where Bhai Sahib used to sit for hours and read a lot of Bani. Bhai Sahibs Nitnem consisted of 5 Sukhmani Sahibs in addition to the compulsory Bania read by a Gursikh. He would rise at 12.30am and recite Nitnem, sometimes he would recite Gurbani until 8.30am. Bhai Sahibs thirst to read Gurbani continued throughout the day and he would regularly recite Chaupai Sahib on the way to College, and whilst walking around. Bhai Raju had a keen interest to read and study CID novels in his spare time. His mother would tell him off and say “why are you reading these books? Why don’t you read more Bani?” Only later she realised that he read those CID novels to prepare himself for the seva he was going to accomplish. Bhai Baljinder Singh and Bhai Sukhdev Singh ‘Sukha’ often travelled to Punjab to listen to Sant Jarnail SinghJi’s diwans. They were inspired by the ‘Bir Ras’ (warrior spirit) in the speeches of Sant Ji. Mata Surjit Kaur encouraged Bhai Sahib to meet Sant Jarnail Singh Ji, as she believed it had a positive effect on him. She saw an increase in his love for the Panth and eagerness to help others. 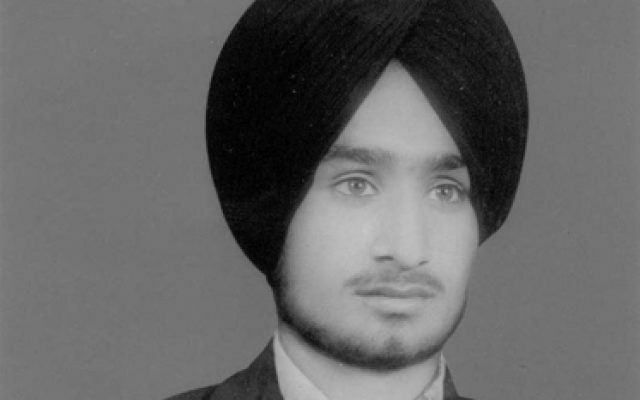 Like many other Sikh youths, the attack on Sri Harmandir Sahib in 1984 was the turning point in their lives. The army led invasion to slaughter thousands of Sikhs on the ‘Shaheedi Purab’ of Guru Arjan Dev Ji Maharaj, under the orders of the devious Indira Gandhi laid the foundation for Khalistan. Sant Jarnail Singh Ji stated that the day Sri Harmandir Sahib is attacked this will lay the foundations for Khalistan, Sant Ji’s word came true. On the 1st June 1984, the Hindustan government surrounded Sri Harmandir Sahib and many other Gurdwara’s in Punjab. Bhai Sahib had heard that Sikhs were being murdered, tortured and even raped in Sri Harmandir Sahib by the Hindustan army, and as a true son of the Guru, he quickly came home and without any care for his life, left with his father’s rifle. Not much is known about where Bhai Sahib went or what he did. All that is known is that throughout Hindustan, some sat in disbelief, some cried, but then there were a handful of brave warriors who came to the rescue of those being persecuted throughout Punjab. Bhai Baljinder Singh Raju left everyone, and everything he knew, at the cries of his fellow Sikhs being persecuted at the hands of the enemy. Later that day, the local Sangat (about a thousand people) got together at Singh Sabha Gurdwara Sahib and did Chaupai Sahib Paat as they felt helpless many miles away from Sri Harmandir Sahib. They protested the attack on Sri Harmandir Sahib; however the Gurdwara was suddenly surrounded by the CRPF and the sangat were told to go back to their houses or they would be shot. The Singhs left in the morning for Pakistan, they went for training and to build links with other freedom fighters. Later, Tajinder Singh, Ravinder Singh and Amritpal Singh returned to Punjab and were unfortunately caught by the police. They were severely tortured; they were beaten for days on end without any food or water. The Singhs were hung upside down repeatedly asked who their associates were. All them, one by one was severely electrocuted; this was to not only weaken their body but also their minds, so that they might reveal the whereabouts of other Singhs. The police thought these techniques would dispirit Singhs from joining the armed struggle for Khalistan, little did they realise that these were the sons of the same people that were sawn in half, cut limb my limb and had their own children cut into pieces and put around their necks. Bhai Raju returned from Pakistan in August and met with Bhai Sukha. Bhai Raju introduced Bhai Sukha to his cousin brother; Bhai Harjinder Singh ‘Jinda’. Arguably two of the most lethal and skilful Singhs of the movement were finally united. Unknown to the world and themselves Sukha and Jinda’s names would go down in history alongside many of the great martyrs of the Khalsa Panth. The Singhs discussed plans in Punjab and then masterminded a strategy on how they would go about to fight for Khalistan. A conclusion was reached that it would be best to carry out their operations in Delhi. The Singhs made their way to Delhi and set up a base there to operate from. This was a very dangerous but necessary move. They knew by going to Delhi they stood a higher risk of getting caught, however they could also get closer to the enemy and avenge the attack on Sri Harmandir Sahib and the November 1984 Delhi massacre. Their idea was to shake the central government and to pressure them to give us Khalistan. Mata Ji realised that the Singhs had made their minds up on what they wanted to do. She did a heart felt Ardas to Guru Sahib for the Singhs to start their seva and for the Khalsa Panth to remain victorious. Later, while the Singhs rested sleep, Mata Ji remained awake all night reciting Sukhmani Sahib. Mata Ji woke the Singhs up at 4am and they left early morning; their mission to strike fear in the heart of the central government had begun. Many high profile characters were eliminated by this group of fearless Jujharoos, the likes of General Vaidya (who the commanded in the army into Sri Harmandir Sahib), Lalit Maken and Arjun Dass were all systematically assassinated one by one. A close associate of Sukha and Jinda once said: “whichever target we went for we eliminated, that was our record, no one escaped our hands”. They reached their goal in shaking the central government, and all those who instigated the attacks on the Sikhs were continually looking over their shoulders, wondering if they would be next. The police left with nothing, however, the more the Singhs became wanted by the police; the more brutal the police treated the Jujharoos families. Bhai Raju’s father was once unlawfully arrested by the police in 1986 as they wanted to find his son. He was stripped down to his Kacchera, tied to the back of a police jeep and dragged across the roads. He was then taken to a police station where he was brutally tortured for 15 days. His legs were pulled apart forcefully, all his muscles were torn and he was ferociously beaten. Though he knew nothing, due to these cruel acts, Bhai Raju’s father wasn’t able to walk for many weeks. The viciousness did not stop there; Bhai Jaswinder Singh (the younger brother of Bhai Raju) was taken by the police and was ruthlessly beaten and tortured for many days. His injuries were so bad that he had to stay on a hospital bed for 9 months and had consequently been diagnosed with tuberculosis of the bone. His spine had also been damaged due to torture that was carried out. As years went by the police had realised that these Jujharoos were not going to stop their armed struggle. They stepped up their efforts to catch these warriors of Sri Guru Gobind Singh Ji Maharaj. Unfortunately, Sukha and Jinda eventually were arrested and were kept in Jail. Bhai Raju in the meantime had assassinated police black cat ‘Santokh Kala’. Due to this, the police stepped up their attempts to apprehend Bhai Raju and was high up on the Punjab police’s wanted list. Gradually, Bhai Raju built a strong link with (Shaheed) Bhai Kanwarjit Singh Sultanwind. They had made a plan to kidnap a very high profile personality and negotiate with the Hindustan government to release Sukha and Jinda in return for the VIP. The mission was half way in motion and the Singhs were ready to execute a flawless plan. However, due to an informant, Bhai Raju was caught by the police on the 9th June 1989 in Jalandhar. The Lion was finally trapped at the hands of the Jackals. He was relentlessly tortured for days upon end; he was not given any food or water. The enemy tried to break the brave soldier of the Guru into pieces, but he did not falter, the Guru’s Singh was made of iron. The police did not want to give up, they thought they could obtain some information about other Jujharoos from Bhai Raju but with the grace of Waheguru he never spoke a word. (Shaheed) Bhai Satnam Singh Bawa was also logged in the same police station as Bhai Raju and witnessed the torture of Bhai Sahib. Bhai Bawa met the family of Bhai Raju in July 1989 when he broke free from jail. He told them that the police, under the command of SSP Suresh Arora, became frustrated because Bhai Raju would not tell them anything. They tried every form of torture but this courageous Jujharoo did not break. Bhai Satnam Singh said they could not even get Bhai Raju to admit his name, even whilst being electrocuted.